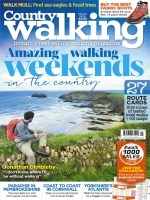 Britain’s best selling walking magazine, Country Walking is written by the UK’s leading walking enthusiasts and gear experts. Each issue is full of authoritative reviews, stunning features, beautiful photography and great advice to inspire you to explore Great Britain and the world on foot. Country Walking is an inspiration on the sofa, a guide on the walk, a friend in the gear shop, and the friend to share stories with afterwards. Every month, Country Walking Magazine provides a fantastic selection of walk routes and ideas showing you the best places to walk and stay, eat and drink and giving advice on the gear you should take as well. This magazine will help you get the most out of your walking adventures, so don’t miss out, order your subscription today. Amazing walking weekends in the country… Walk Mull – find sea eagles and fossil trees… Buy the best fabric boots – 14 pairs tested… Paradise in Pembrokeshire… Coast to coast in Cornwall – take on a mini adventure you’ll never forget… Yorkshire’s Atlantis – walk the Dale drowned by a beggar’s curse… Great escapes – four springtime walking weekends for under £50… Chasing waterfalls – discover Britain’s most spectacular cascades… Northumberland’s wild frontier – explore enchanting castles along this deserted coastline… Go west – adventures on foot on Donegal’s Atlantic coast… Festival fever – the best walking festivals in Britain… Order your Country Walking subscription now for more inspiring features, expert reviews and practical advice each month. Who Reads Country Walking Magazine? Busy people who value the chance to escape everyday life and explore the countryside. Country Walking readers walk for pleasure in the UK and abroad and love to keep fit and stay healthy.